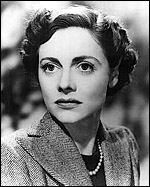 A late recruit to the screen, Celia Johnson quickly acquired iconic status in British cinema and has maintained it, despite how few films she made. It is probably the eyes, as she acknowledged: she stares at the audience and breaks its heart as she sees her would-be lover, Trevor Howard , head off to catch his train out of her life in Brief Encounter (d. David Lean, 1945, Oscar-nominated for best actress). This is the definitive Johnson role: she makes utterly real all the constraints (and comforts) of a decent middle-class woman's life: but there are other cherishable performances, too. In another Coward - Lean film, This Happy Breed (1944), though her accent wobbles a bit at times, she is the stoical lower-middle class housewife and mother to the life, unbearably moving as she comes to terms with the defection - and return - of her rebellious younger daughter. As the self-sacrificing daughter of a benignly selfish parson in The Holly and the Ivy (d. George More O'Ferrall, 1952) and as a conscientious probation officer in I Believe in You (d. Michael Relph, 1952), she makes goodness interesting and touching. That she could also do comedy is seen in The Captain's Paradise (d. Anthony Kimmins, 1953), parodying her usual image. She can do nothing with the awful Coward piece, The Astonished Heart (d. Terence Fisher, 1950 - 'I'll just have a tray in my room') and is miscast in A Kid for Two Farthings (d. Carol Reed, 1955). No doubt stage (from 1928 to 1982, in Shakespeare , Rattigan , Ibsen , Coward , etc) and perhaps TV (from 1937 to 1982, especially Staying On , 1980) gave her more varied opportunities, but for the best of what she did on screen filmgoers should be grateful. She married explorer Peter Fleming and is the mother of TV actress Lucy Fleming (b.Nettlebed, 1947), seen in Pride and Prejudice (BBC, 1995). She was awarded a CBE in 1958 and DBE in 1981. Lucy Fleming, Celia Johnson, 1991.